These zesty Italian seasoned pretzels are an addictive snack that is so easy to make, but hard to stop munching on. I’ve found a million seasoned pretzel recipes online in the last few months, but almost all of them have ranch and dill weed. While I love those flavors, that just wasn’t what I wanted for my pretzels. I had a specific pretzel craving that needed solved. I blame the grocery store sample ladies. My grocery store has the best free sample ladies. They are sweet older ladies who know me by name and pull me in for a hug when I’m in the store. They always give me the full scoop when it comes to the samples they are sharing, so I knew when Eileen told me the pretzels she had were good, that they would be. And boy, oh boy, were they good. The pretzels were full of flavor with a bit of garlic and a zippy and zesty, almost spicy finish. She looked at my face and said, see I knew you’d like those! But I was not prepared for the price tag on the little bag of pretzels- $5. We immediately started our research on how we could make these awesome pretzels ourselves! 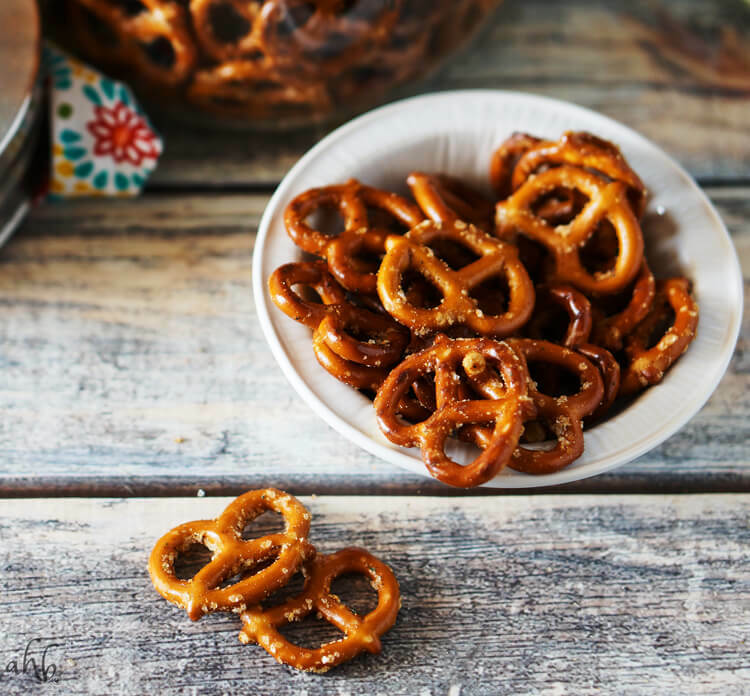 (Read: we ate the whole darn bag) It took several tries and recipe variations to nail these zesty Italian pretzels, but I’ve finally come up with a copycat recipe that I think it every bit as good as the original. You’re going to love this one, but be warned. It’s hard to stop once you’ve started. 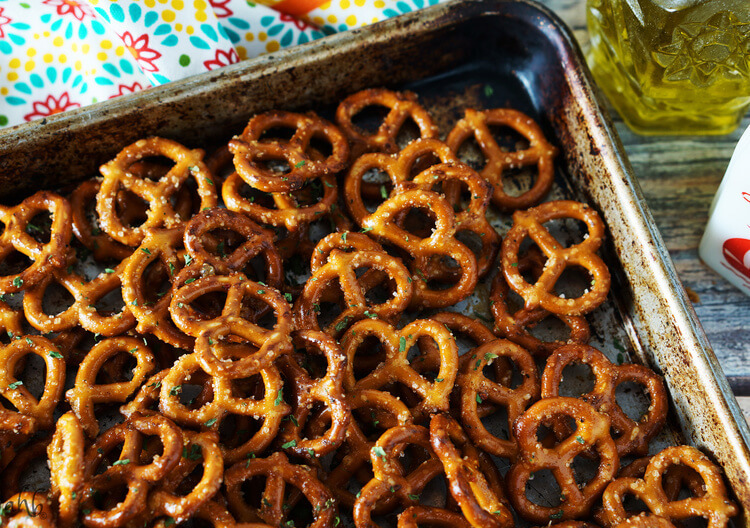 Zesty Italian seasoned pretzels are an addictive snack with a zippy garlic flavor and a bite of spiciness to them. Place the pretzels in a large resealable ziplock bag. Mix together the seasonings with the oil and butter and pour over the pretzels. 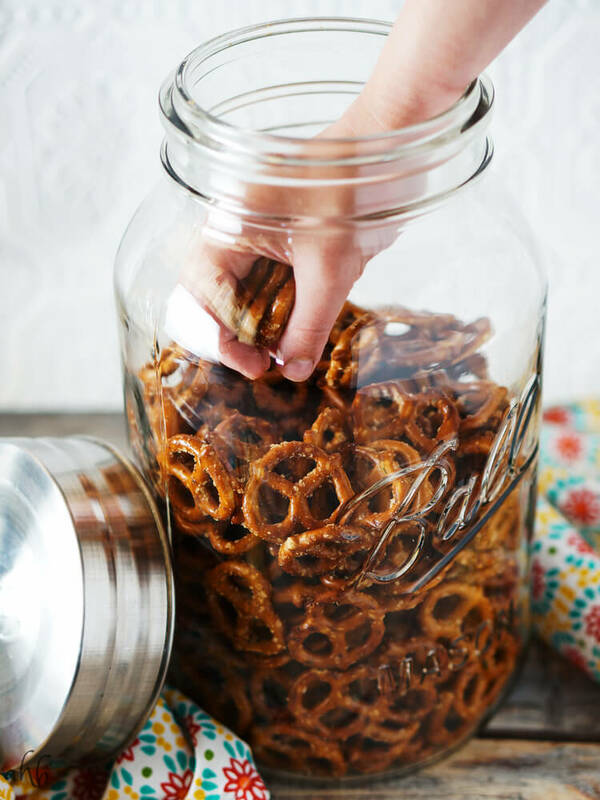 Shake the bag to coat all the pretzels. Let the pretzels sit for 15 minutes and then shake the bag and flip it over to the other side. Let it sit another 15 minutes. Preheat the oven to 250 degrees. 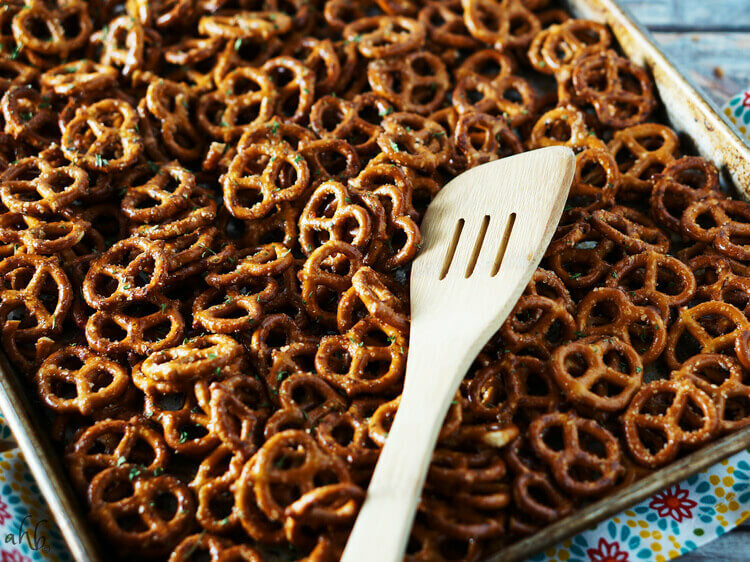 After 30 minutes of marinating the pretzels, spread the pretzels evenly on a large cookie sheet and bake at 250 degrees for 30-45 minutes, stirring halfway through the baking time. You'll know the pretzels are done when no more oil seems to appear on the pretzels and they look well dried. 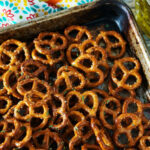 These pretzels are a great snack to take to a party or a picnic. 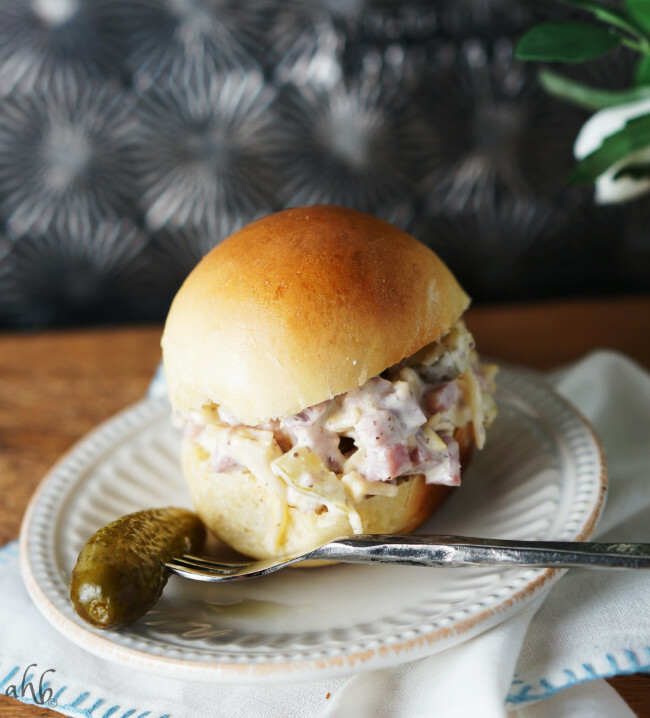 Add some Cuban ham salad sandwiches and a strawberry lemonade shandy with it and you’re set! Were the original pretzels you tasted Dot’s Homestyle Pretzels? 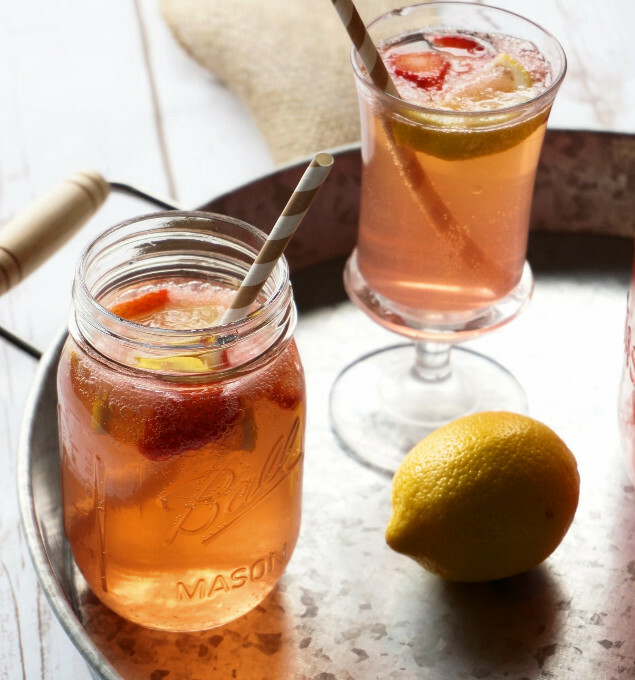 We love those and can’t wait to make these. 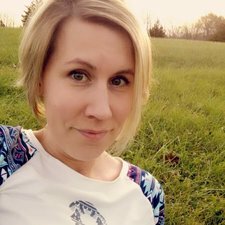 Yes, the original pretzels were! Hope that you guys will love this recipe then. Diane, I wish I had a better answer, but I’ve never had them last long enough to worry about going stale! My guess would be around 7-10 days. I can’t live without these! Thank you so much! I love how spicy they are and I can never eat pretzels the same way! Thank you so much for this recipe!!! I’ve made these before 8n the microwave too. Just cook for 4-5 minutes; stir after each minute. Well that’s a quick and handy hack, Jan! Thanks for sharing. We made these week & really liked them! My kids thought they were a bit spicy, so next time I might use a little less cayenne. Great flavor! They definitely have a little bit of a zing to them! I’m so glad that you guys enjoyed them!